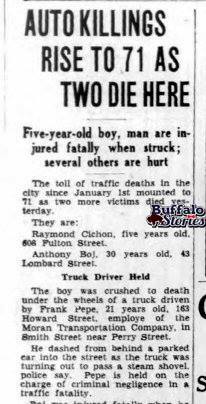 These are stories about my grandfathers– Edward V. Cichon and James J. Coyle. 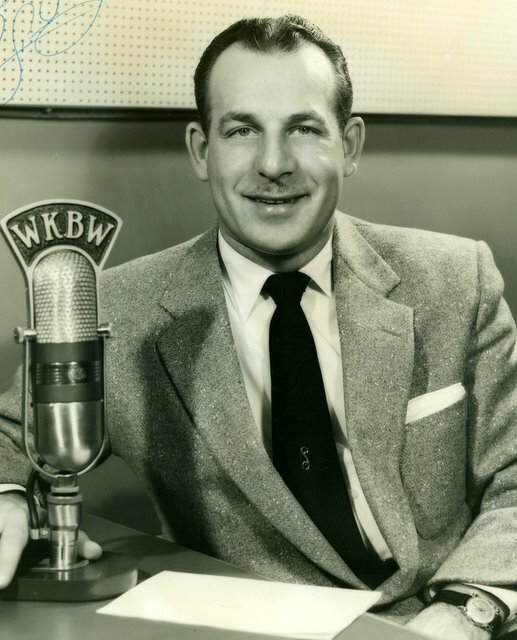 BUFFALO, NY – Anyone who knew my Grandpa Cichon knew there was a certain joyfulness in his voice– always. His heart was always smiling, and that showed through in his voice. I might count on one hand the exceptions in the 36 years I knew him. 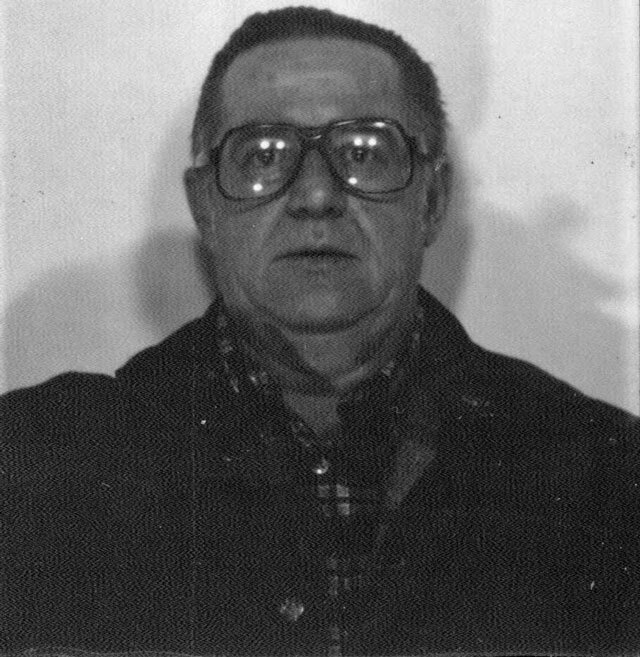 Gramps trying to look serious in a photo for his Harness Racing Commission license. One notable time was when the full service gas station guy screwed him on the amount of gas he pumped into Gramps’ car. Gramps probably asked for $5, which he figured should have about filled up the tank. 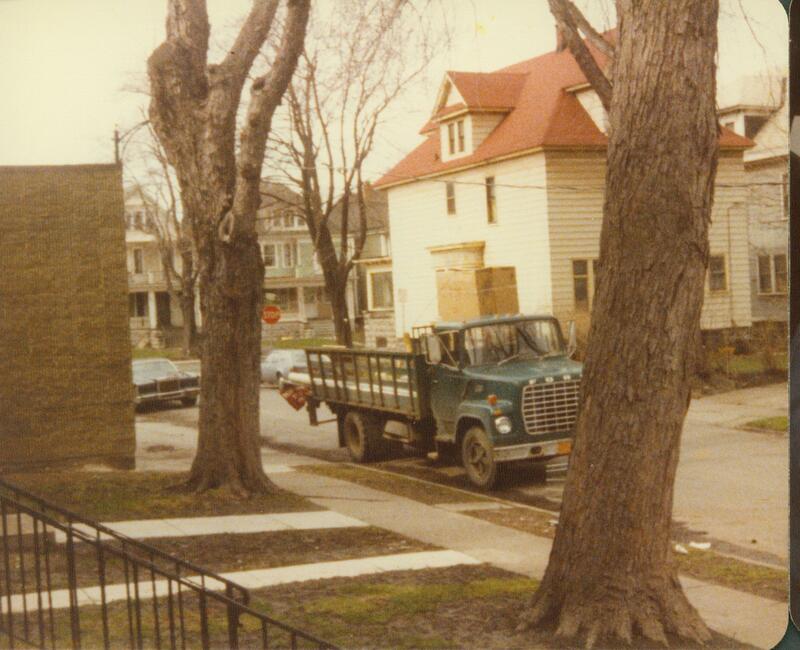 We barely got a block up Seneca Street when Gramps threw on the brakes and made a hard u-turn back towards Petro USA. 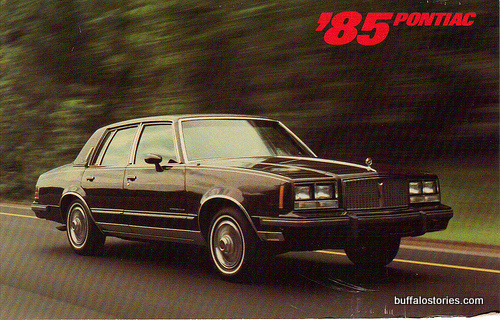 “You goddamn horseball!,” Gramps screamed out the window, as my brother and I barely contained our laughter, sitting on the red plush seats in the back of the black 1985 Pontiac Bonneville. We’d never seen Gramps like that, and I think that’s pretty much the only time I ever saw Gramps really mad. Again, it was also one of the few times I saw him more serious than filled with joy. Now gramps was blind, and didn’t around well for the last few years of his life. Some men in that situation would want, say, booze snuck into the nursing home. Not Gramps. Donuts or hot dogs with slivered onions and sweet relish were all he wanted. I’d usually bring him one or the other, sometimes both. Over the course of 90 minutes, I’d hand him 3 or 4 timbits. Once I made a joke or said something stupid about donuts. Again, one of the few times I ever heard him this serious. “Son,” he told me with the tone of life and death at stake, “Donuts are as good as gold.” I was satisfied there was nothing greater I could do for him than visit and bring chocolate timbits. The “beautiful” food they served was always a topic of conversation. Food was Gramps’ all-time favorite subject, perhaps a left over affect of growing up in the Depression when there was never enough to eat. The last time I visited with Gramps, he was talking about how they’d served kielbasy that afternoon. Kielbasy is the Polish plural of kielbasa, and we’ve always called Polish sausage (ka-BAAS-ee) in my family. 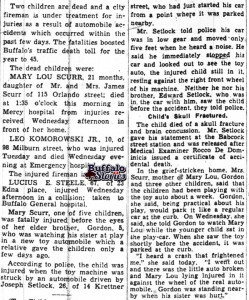 I wasn’t sure what to think, though, when Gramps’ tone turned a bit hushed and he got somewhat serious, maybe as serious as I had heard him since he bawled out the South Buffalo gas station guy almost 30 years earlier. 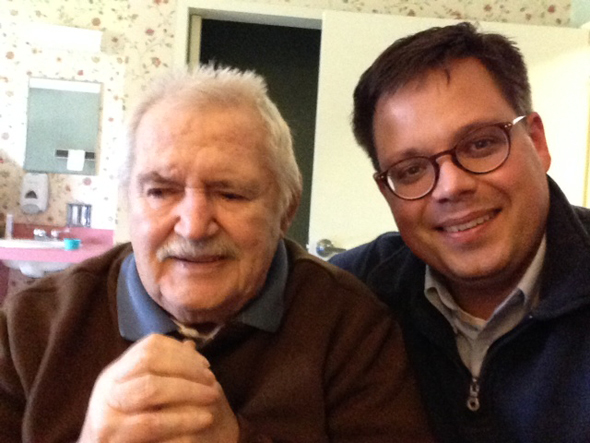 The most serious conversation I’d ever have with my beloved grandfather, the man who my Uncle Tom called “the best polack who ever lived,” was about “kielbasy.” Polish sausage. Good ol’ Edziu wanted to know my freaking Polish sausage preference. It’s really about the most marvelous thing ever, really. With Easter upon us, there’s been plenty of social media talk of Polish sausage. All I can think about is Gramps’ favorite– kielbasa on rye bread with Weber’s mustard. I’m doing it this Easter. I’m bringing the rye bread and Weber’s just to make sure. I’ll bite into that Old World combination of flavor, and think happily of Gramps. The hunk of kielbasy won’t be fried up in lard, but that sounds like something maybe to look forward to sometime soon. 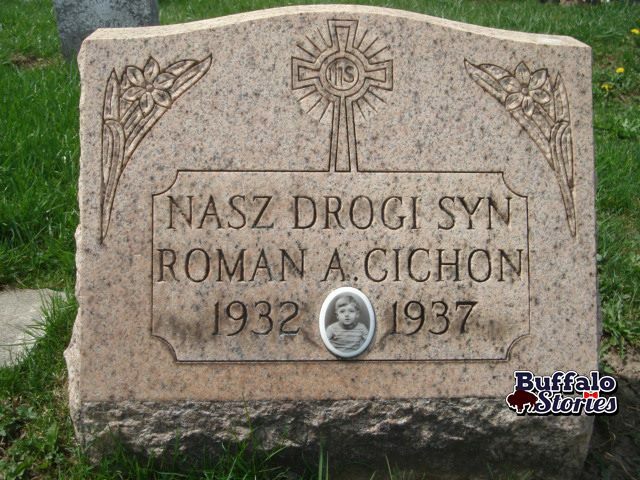 BUFFALO, NY – With Ralph Wilson in the news, today I was talking with a few co-workers about death and dying. 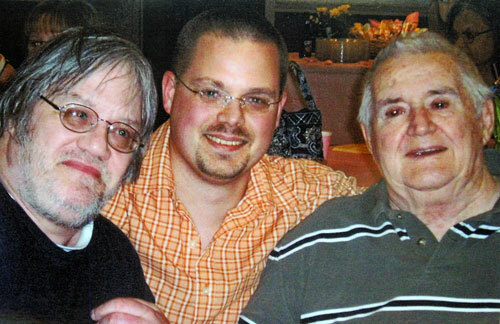 The Ol’Man (my dad, Steve Cichon), Me, and Gramps (dad’s dad, Edward Cichon). Just hanging out at the Msgr. Nash K of C Hall, South Legion Dr, 2008. I’d found myself in the same situation as Mr. Wilson’s family over the last few weeks. While I had hoped that my grandfather would live forever, or at least til he hit a birthday worthy of a Willard Scott mention; the truth is, Gramps was 88, and had been in slowly declining health for over a decade. It was a mix of great hope and sad acceptance in thinking about Gramps for a long time, until he did pass away March 4th. I grieve the loss of a simply beautiful man, but equally feel some satisfaction in accepting the simply beautiful long life he lived. As is often the case with death, it’s not quite that simple. We’ll all be attending a service for Gramps on Friday, which is also the anniversary of my Dad’s death a few years ago. 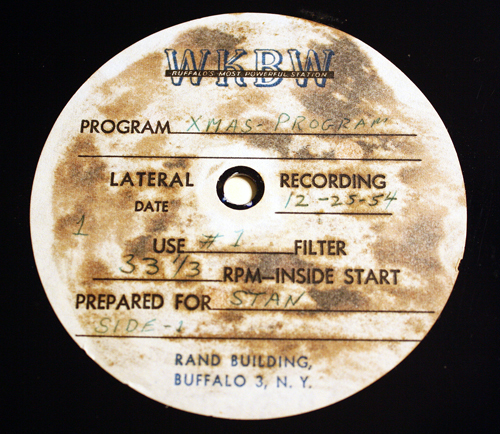 In our little conversation around the coffee pot about Ralph Wilson and death, I was about to mention something about about Dad’s death, when I realized I didn’t know without thinking how long it had been. I just barely controlled myself, with the thunderpunch of a thought that Dad died so long ago I can’t immediately remember. It was four years ago. And four years later, that thought that I had to do math in order to remember how long it had been since I sat with dad, laughed with dad, talking with dad, yelled at dad… It was as if he’d just right now died all over again. But having a Mass for Gramps on the anniversary of dad’s death is somehow appropriate for me. 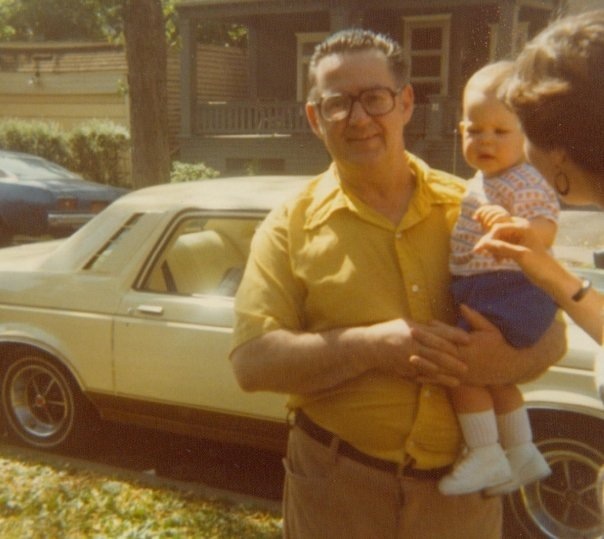 Losing a father is a complicated, awful, inward, outward emotional mess. Dad was very sick, and for a long time, I had tried to steel myself for the inevitable– but there’s no way to prepare. Especially when the most difficult part of it all was completely outside of me and my control. Gramps. Spending 3 years and 11 months talking with Gramps about my dad and the fact that he’s gone while trying to keep it all together was emotionally difficult beyond words. My dad was more than Gramps’ son, they were best friends. In his own illness, my dad thought more about Gramps’ well-being than his own. He called him 3 or 4 times a day. They kept each other smiling, and kept each other in line. My dad’s last mission in life was doing what he could to take care of his dad. My dad never asked for much for himself, but I know if we would have had the opportunity to talk heart-to-heart with me before he died, dad would have told me to take care of Gramps. I did my best, which sometimes wasn’t good enough. A call to Gramps could be crushing, and frankly, I wasn’t always up to it. It was generally heart breaking talking with Gramps. Four or five times in the course of a 90 minute visit, he’d talk about how much he missed my dad. 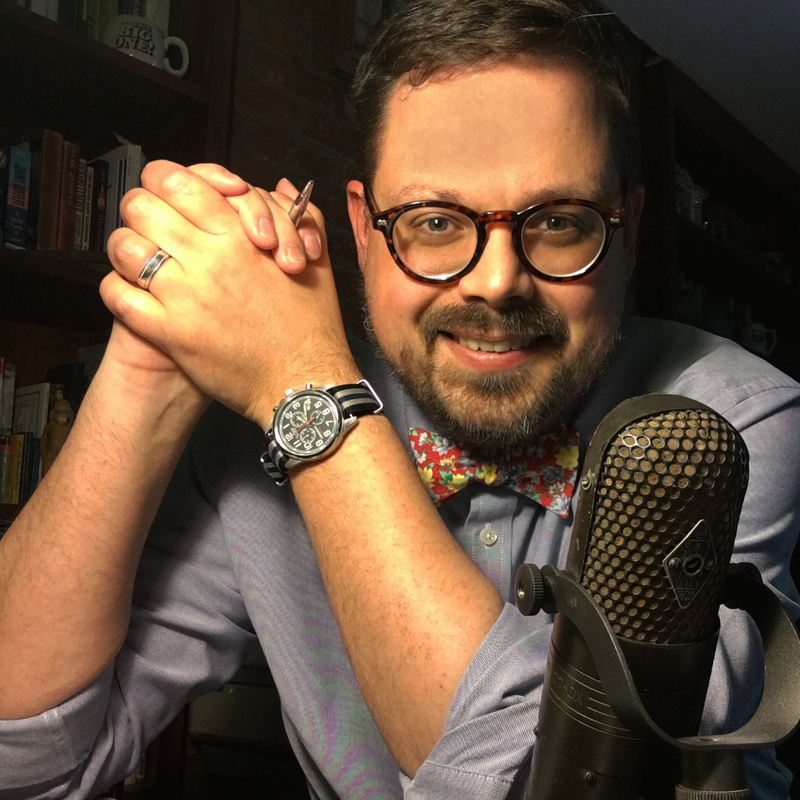 I sat through it, discussed it, even encouraged it– despite those thoughts ripping the heart out of my chest and leaving me drowning in emotion every time. But of course, what ever pain I have dealing in the death of a father, I can’t even imagine the pain and emptiness of dealing with the death of a son. Once I mentioned that I had some recordings of my dad. Gramps almost started to cry, his voice shaky. “I’d love to hear his voice again, Son.” I have not and cannot listen to the hours and hours of Dad I taped through the years. I just can’t bear it. I found a short conversation I recorded when my dad called me at work one time to wish me a happy birthday. It’s dad happy and full of life… which in his last few years wasn’t always the case. Still, most of the dozens of times I played the one minute phone message for Gramps, tears uncontrollably streamed down my face. A few times I felt nauseous. Gramps often cried too, but it was therapy he relished. For four years, my mourning has been wrapped in the context of completing Dad’s last mission and being there for Gramps in sharing his pain and loss. Right after he died, I wrote about what a perfect grandfather Gramps was to us when we were little. Now that he’s gone, I’m realizing pretty strikingly that once again, Gramps was helping me far more than I could have ever helped him in talking about and thinking about my ol’man. 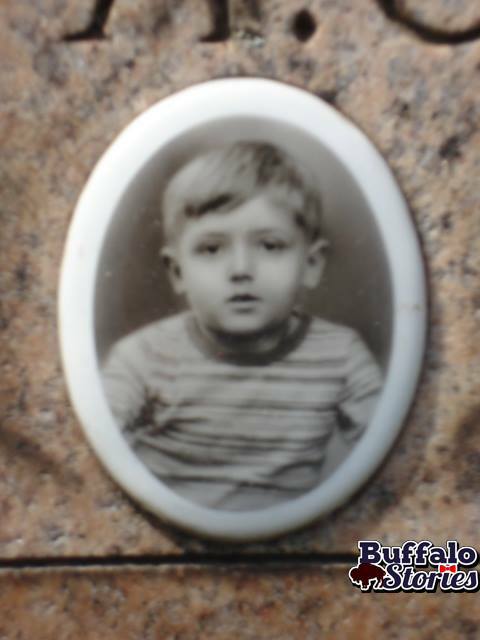 BUFFALO, NY – Valentines Day was the perfect day for him to be born, as he was in 1926. To say Gramps had a big heart isn’t telling the whole story. Nor is it enough to say his heart was pure. 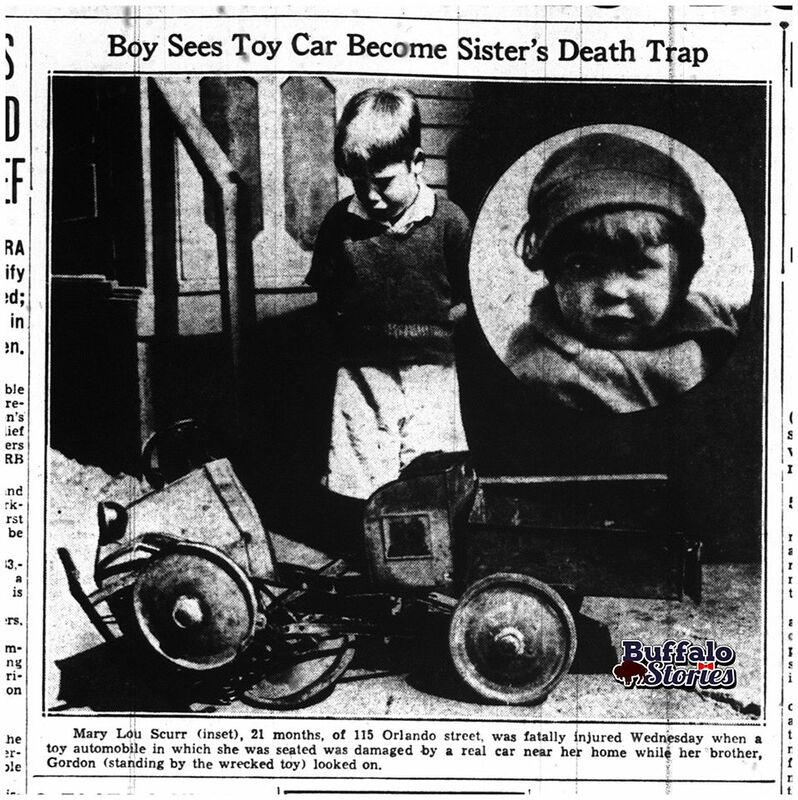 Edward Valentine Cichon had a childlike heart. He was filled with goodness and optimism. He was filled with giving and generosity. He was filled with happiness to know that you were happy. He was the perfect grandpa. He’d walk us over to Caz Park, getting us jazzed up about “the swings… And the slides…. And the horseys…” It was the same sing-song order he’d mention them every time. But first we’d walk through the park. Occasionally, that meant filling our pockets with chestnuts from the trees just past the St. John’s parking lot. Sometimes that meant sitting for an inning of softball or baseball. Gramps usually had a couple of apples in his pocket for us, sometimes a banana. He taught us how to shine up the apple on our pant legs. Also in his pocket was the handkerchief, which kept our noses in check when it was chilly. To keep our bladders in check, if it was just us men, we’d be pointed to some trees. If we had ladies with us, we were told not to touch anything in the Caz bathrooms, unless you were using your foot to flush. Then we’d cross the bridge, throw a few of those chestnuts in the creek, and continue on through “the jungle,” as Gramps called the path on the Abbott Rd side of the path along the creek. We’d look for “the lions… The tigers… The monkeys…” The same list every time, said with the same cadence as the other list, except this one was often enhanced with Tarzan noises. OoOoAaaahah. “I saw a monkey in that one last time,” he’d say pointing at the same tree every time. Finally, we’d get to the playground, and Gramps would sit on the bench until we were done. Sometimes longer, if he didn’t feel like moving yet. “Go catch grandpa a bird,” he’d say, encouraging us to sneak up quietly behind a robin or a swallow so we could scoop ’em up. I don’t remember ever catching one. Almost every time we’d stop at Quality Food Mart, Gramps’ explanation to grandma would start “But Huns! The kids were hungry…” but it would quickly trail off. We didn’t tell, but our ice cream smeared faces and shirts did all the talking necessary. Good ol’Gramps. I bet there is monkey in his tree right now, and he’s happily pointing it out to all the kids. My grandfather is 87 years old. His body is failing him, but his mind is a steel trap. I used to like to ask him questions about things I’d like to know about, but now mostly I listen when we visit. It’s just another one of the many things I’ve learned from good ol’ Gramps. Listening is a powerful, underutilized gift. People don’t like to listen, even when they think they are listening. For example, I used to think I loved listening to Gramps’ stories, but I was always asking about specific things. Once I gave up the steering wheel, I really started to enjoy the ride. I stopped by yesterday, and Gramps told me a few great stories about days gone by, as well as his analysis of the world today. His $600 winner on a $2 ticket at the track. How the Bills should have won every game so far. All the different places he and his brothers and sisters served during the war. Aunt Olga was with Patton. Bringing pennies to Father Baker. 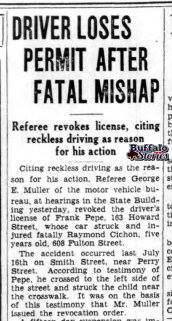 How at 15 he had a mustache, and would go drink at Tippy Toes, and pick up chicks in his 1933 Plymouth. Listening to Gramps, and knowing how much he enjoys having someone listen, has made me a better listener. I love to tell stories, but I’d rather hear a good story well told, by someone who is enjoying the telling. Even if I’ve heard the story 38 times before. The story is the selfish part for the listener. Enjoying the joy with which the story is being told, now there’s a skill we all need to practice, with someone who could really use an ear. My dad has always loved cars. 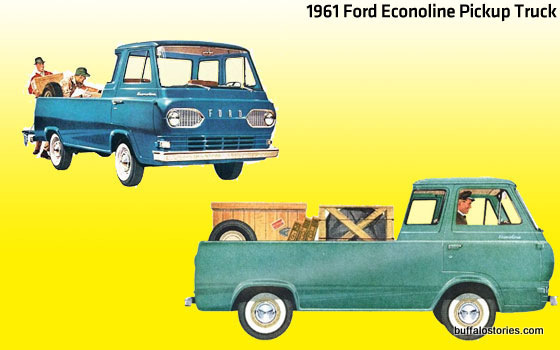 While as a young single guy he had muscle cars (Like an AMC Javelin), and sporty convertibles ( Like an MG), he always took great pleasure in the hunt for new cars. He enjoyed it even when he was buying wonderful (?!) 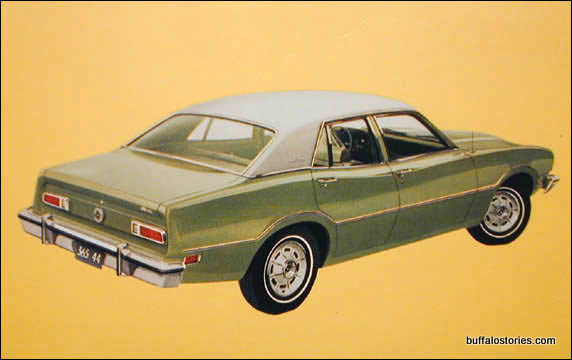 family vehicles like our 1981 chocolate brown AMC Spirit with light brown pinstriping, or our 1983 Dodge Aries faux wood-panelled station wagon. 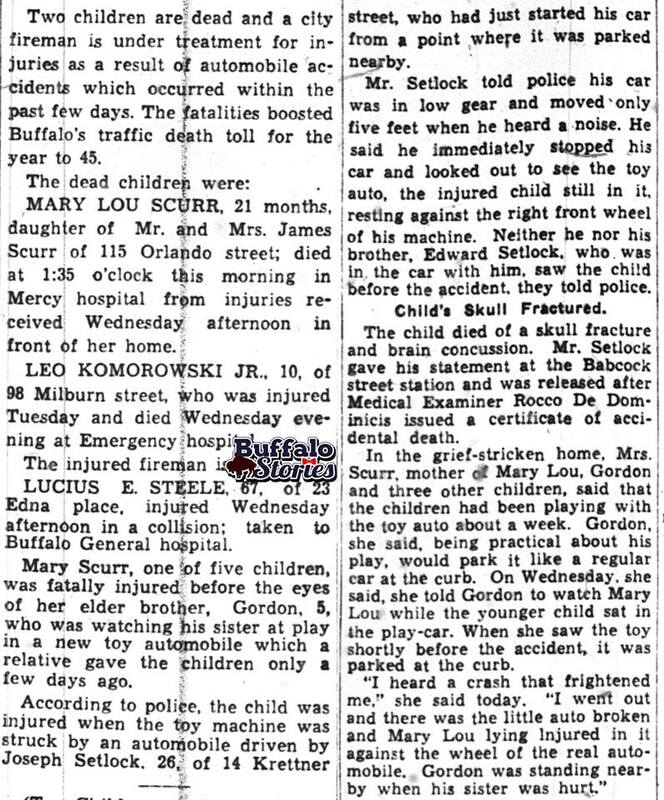 I spent many weekend days driving from lot to lot with my dad… the newspaper filled with red circles around cars that could be the next Cichon Ride. We’d always go after hours as to avoid the salesmen. The Cichon Clan.. before my sister was born.. So probably late 79/early 80. I think my dad still wears that shirt. There were other things to look for, too. “See, son? New tires on this one.” That was always a big selling point with the old man, who seemingly never stopped shopping for a new car. My wife would laugh if she knew that during our most recent car shopping experience in particular, she was actually shopping with my dad via me. Life is much esier once you admit to yourself that, in some ways, it is inevitable to become your parent. Dad’s car obsession continues to this day, though the old man, now with only one leg, hasn’t driven in probably 7 or 8 years. “I’ll be driving soon,” is something you’ll hear him saying often. And you’ll still find Autotrader magazines with big, heavy red circles all over the house. And then there’s Autotrader.com. “There’s a nice convertible Saab… a ’99… before they changed the front on it… Only 7-grand. 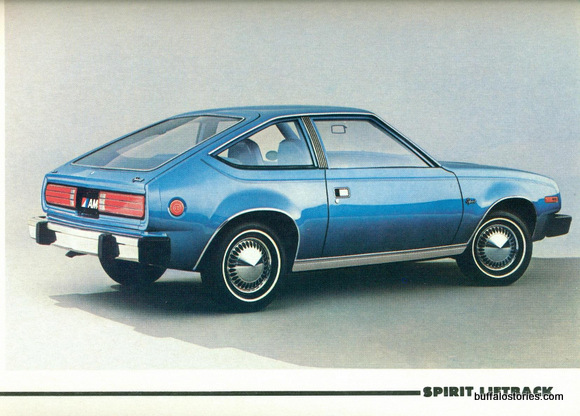 Its in Ohio.” Dad loves the hunt for cars as much as driving, and when my wife first decided a few months ago that it was time to get a new car (for a number of different reasons), Dad eagerly climbed into the passenger seat as we thought about various makes and models, and weighed several bargains. After visiting my folks Friday night, we took a ride to a nearby Honda dealership (after it was closed, of course) to scout things out. We found a good car at a good price, and one of the Civics was unlocked. Really comfortable and roomy. We went the next day to figure out the details, and with the rebates, and generous amount given for our trade in, it was a much greater bargain than either of us could have imagined, and we were both excited about being able to pick up the next car on Tuesday (dealership was closed Labor Day Monday). I was excited, in part, because the dealership was close to the folks house, and we could take a spin by to show the ol’man the new car. Seriously, no one on the planet gets more excited about anyone’s new car than Steven P. Cichon. So, I was a little disappointed when my mom texted me to say that he went to the hospital Sunday (this happens somewhat frequently because of his diabetes problems.) He’s OK, but was in ICU to get his sugar evened out; it was messed up by a viral infection he’d been fighting for a few days. He was his normal self, though still in the ICU when I went up to visit him an hour or so after picking up the car. Happy to have company, and talkative (not always the case, in case you don’t know the ol’man.) After the usual pleasantries, and getting to update on how he’s feeling, I dropped the bomb. “So dad, we picked up our new car today.” He knew we were looking, but had no idea we were close to buying one. Either were we, frankly, until we got the great deal on the Civic. Its an over-used cliche, but there’s no other way to describe it. The twinkle in his eyes was like a kid at Christmas. I’m not one for the gadgets and features, but I always study up, because I know my dad will want to know. He loved that we got a great deal. He loved that the highway mileage approached 40 MPG. “That’s almost like driving for free,” he said. He loved that the dash lights were blue, the same color as one of the big puffy bandage things to keep his IVs in place. But he stopped me on one feature that bowled him over. “Telescopic steering?!? In a CIVIC?!? They only put that in the top of the line Mercedes, for heavens sake!” My dad swears a lot, but he does try to control it. 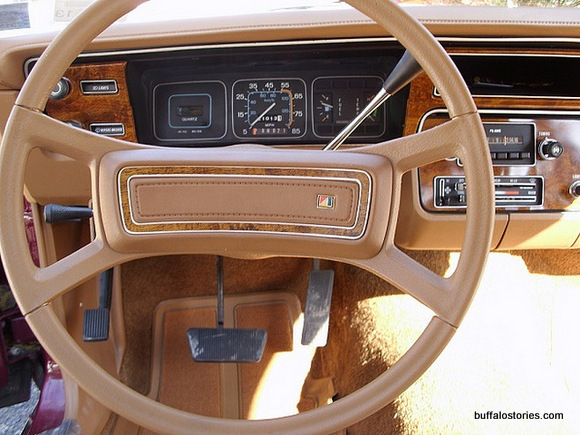 Of the 20 or so cars dad’s owned, only “The Cadillac” had telescopic steering. “I’d adjust it every time I got in, he said, making a holding the wheel motion and moving it all over over the place. That’s what a telescopic steering wheel allows you to do. Monica really likes this feature a lot, too. 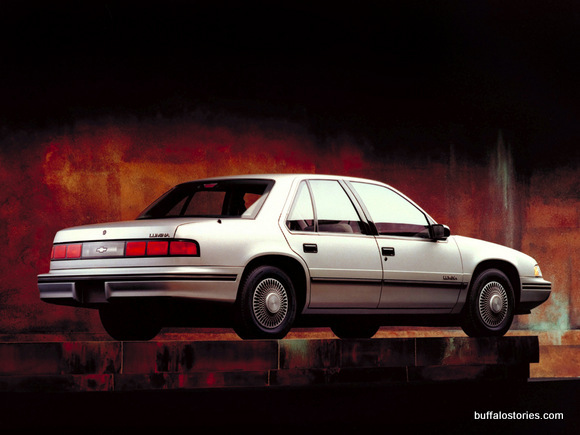 Before I get too far ahead of myself, I should let people know that “The Cadillac” was actually a 1987 Cadillac Cimmaron, which is nothing more than Chevy Cavalier tricked out with leather, a V-6, a useless luggage rack on the back trunk, and apparently, a telescopic steering wheel. And, Dad was almost disappointed when I somehow didn’t figure out how to park the car outside the window of his hospital room so he could look out at it. His eyes are so bad, he wouldn’t have been able to see it anyway. But he will get a spin in it once he gets home from the hospital. I know the ol’man will tell everyone he sees and talks to for the next month about the car. Those poor ICU nurses. The women might get away without hearing about the car, but the men, and there are a lot of male nurses at the VA Hospital ICU, will likely hear a lot about it. And my grandpa. And Uncle Chuck. It makes him so happy, I wish I could buy a new car every day.